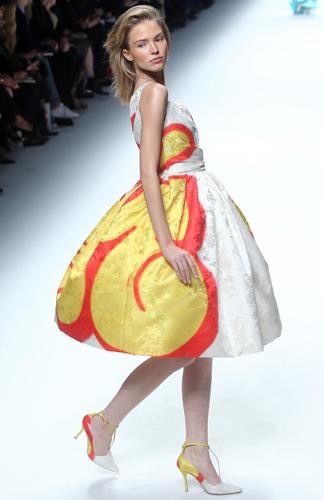 Yesterday at Milan Fashion Week saw the arrival most hotly anticipated Fall show, and one which never fails to make me smile. 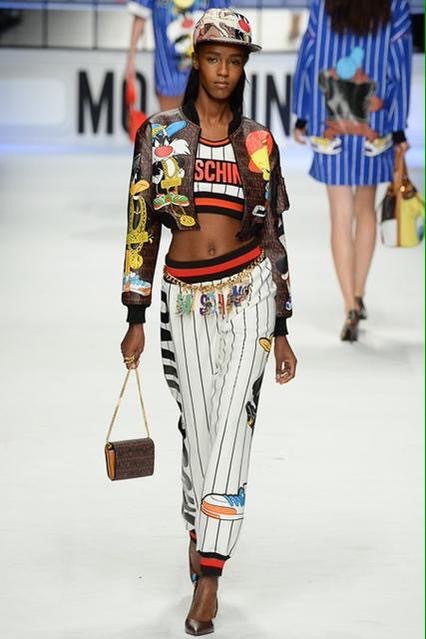 Eccentric and eclectic but always amazing, Moschino gave show-goers a real treat and brought some much needed fun and energy to Fashion Month. 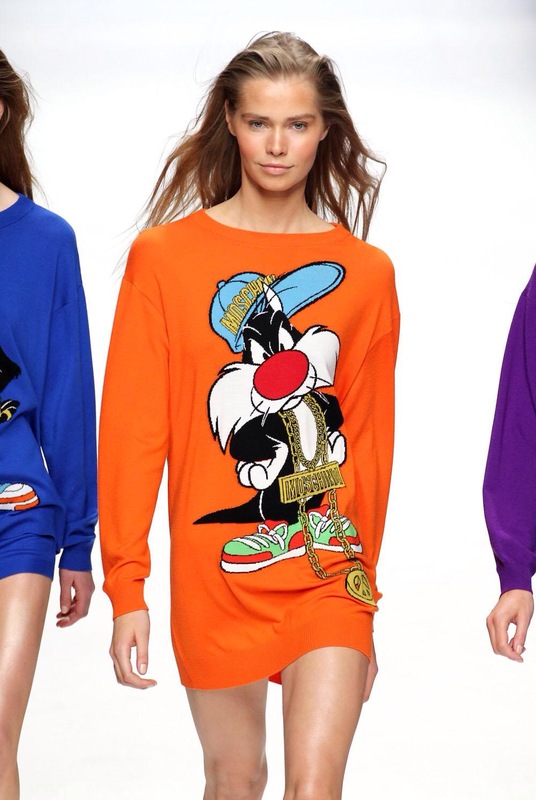 Jeremy Scott is known for taking inspiration from everyday items and brands and re-spinning them into super high fashion, uber covetable and desirable clothing and accessories collections. This season was no different and in fact, may just be the best yet. 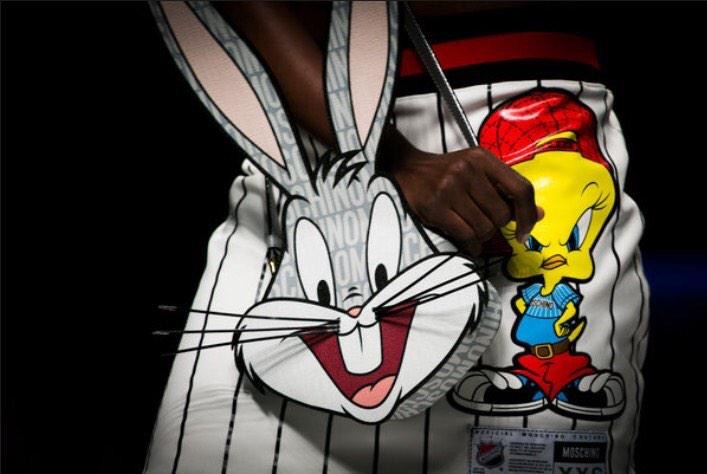 Before the show Jeremy Scott said that he had been inspired by street graffiti and cartoons from the Looney Tunes family and their influence was obvious. 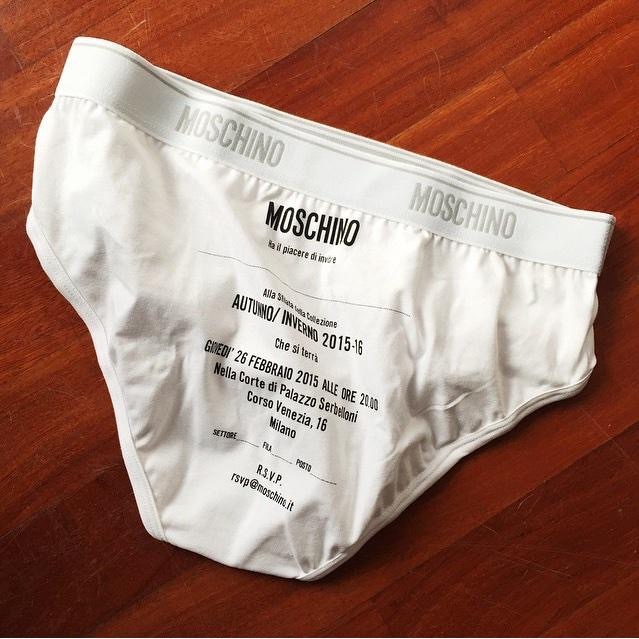 From the cheeky invite (a pair of tighty-whitey underpants) to the boombox show set, this show was delightfully wacky and undoubtedly from the mind of Jeremy Scott. 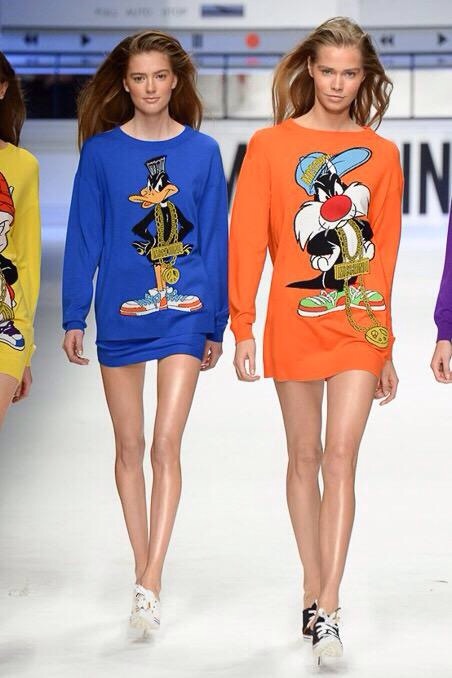 Hair was loose and the beauty look was fresh and flawless, these girls looked like they’d stepped out of the 90’s and straight on to the runway and best of all, they looked like they were having fun; smiles were definitely allowed on the Moschino FW15 runway. 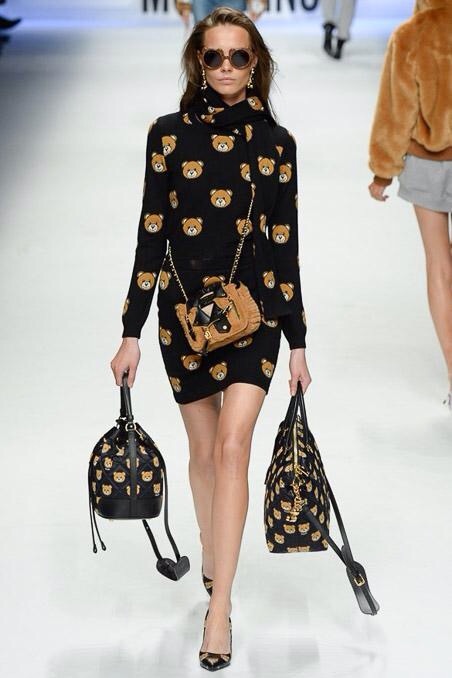 The “Ready to Bear” capsule collection is available to shop online now at Selfridges (and includes the obligatory and affordable at £45 Moschino iPhone cover) so fashionistas everywhere can own a piece of this super desirable collection. 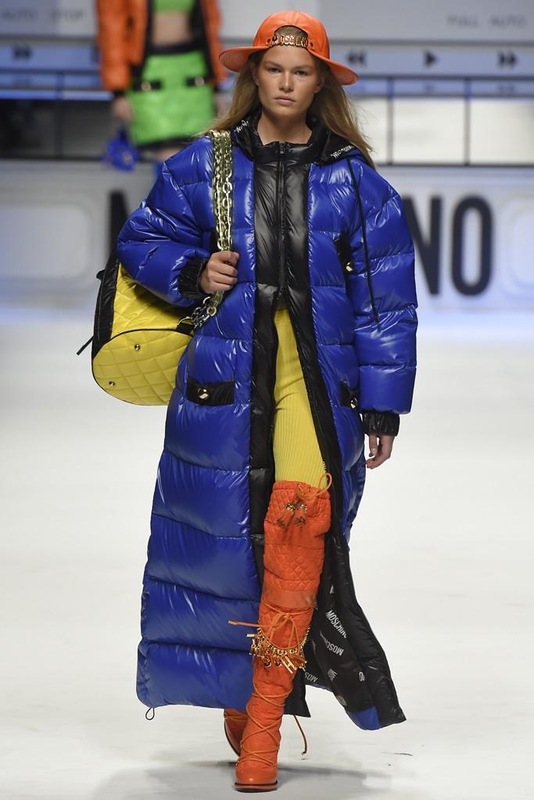 Full length puffa coats made an appearance in this show – a bit of a theme this season, we’ve seen them already most notably at Fendi earlier this week. 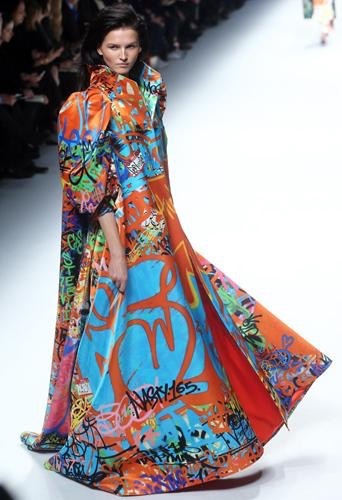 The street vibe section was super cool and something bloggers will be climbing over each other for, bright primary colours and cartoon characters, what’s not to love right? 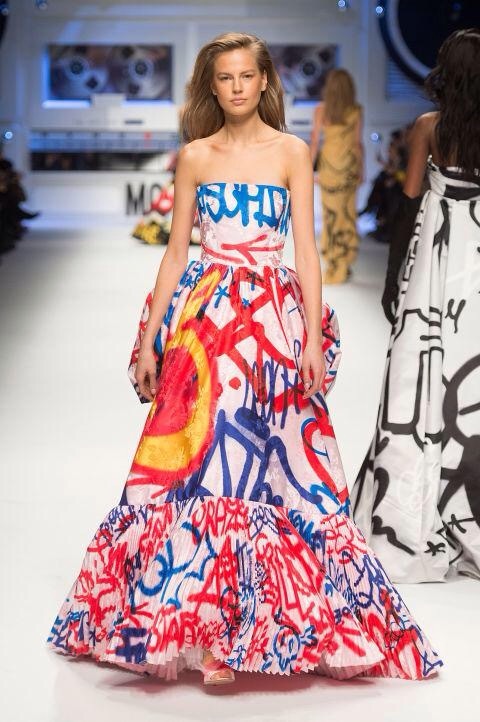 The graffiti inspired gowns were interesting, a new silhouette for Jeremy Scott and a juxtaposition of street and chic, these gowns looked elegant and current with a playful vibe. 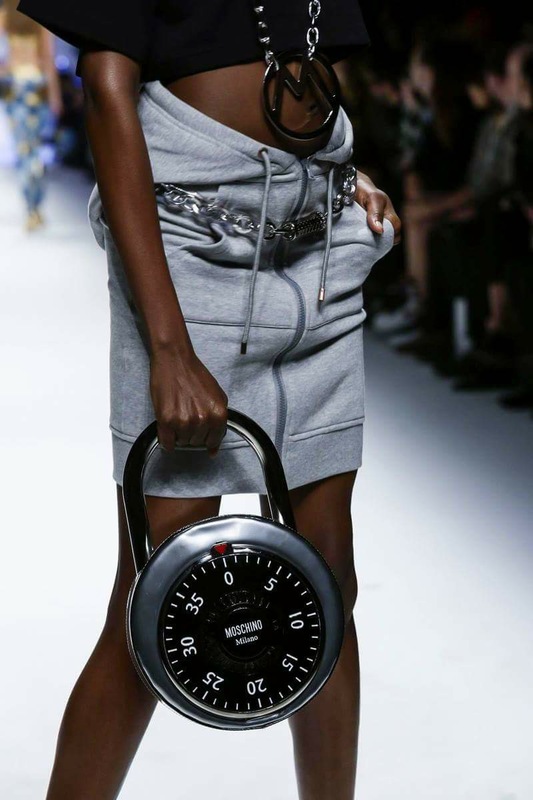 As always, the accessories were on point and are something that every fashion lover looks forward to seeing, sure enough and in keeping with the theme for inspiration, these accessories did not disappoint. 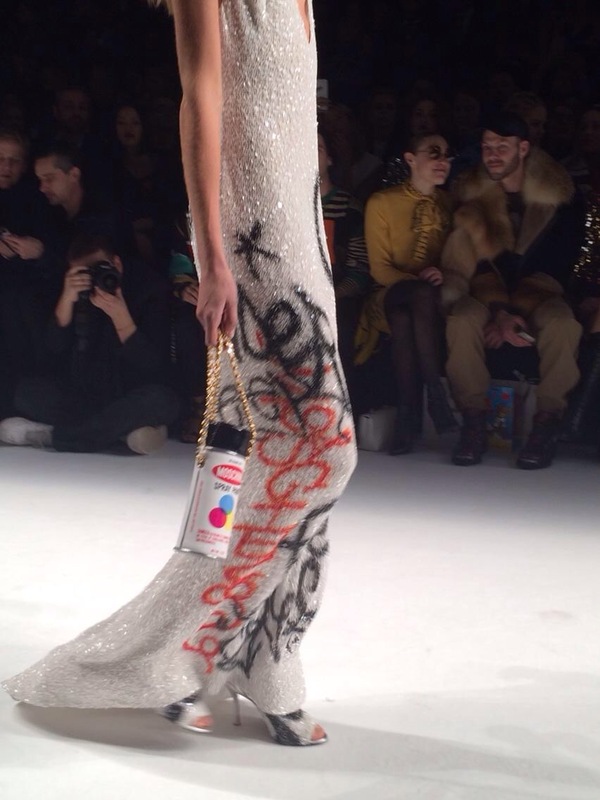 Models carried spray paint can bags, quilted duffels, furry teddy bear backpacks and padlock inspired totes. 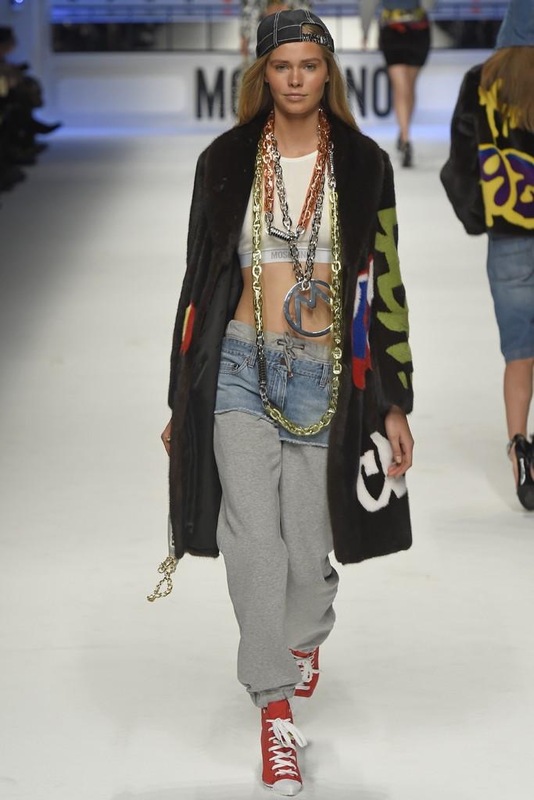 There were twin peaked snap back caps and 90’s style visors as well as signature chain belts and braces. 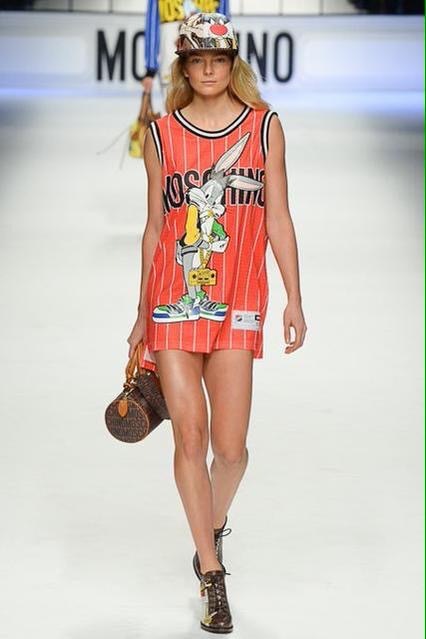 Expect the high street to be saturated with lookalikes pretty soon. 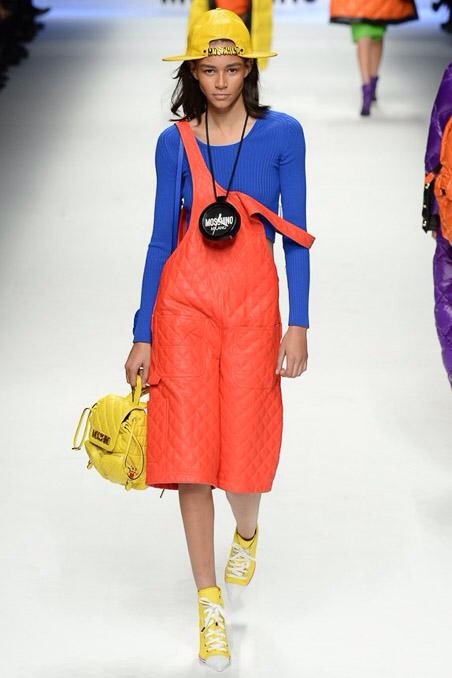 This is one seriously fun collection and one which will inspire a whole host of unwitting school girls over the coming months, it’s great to see Jeremy Scott doing what he does best, giving fashion a playful edge and creating something surprisingly wearable and seriously covetable. 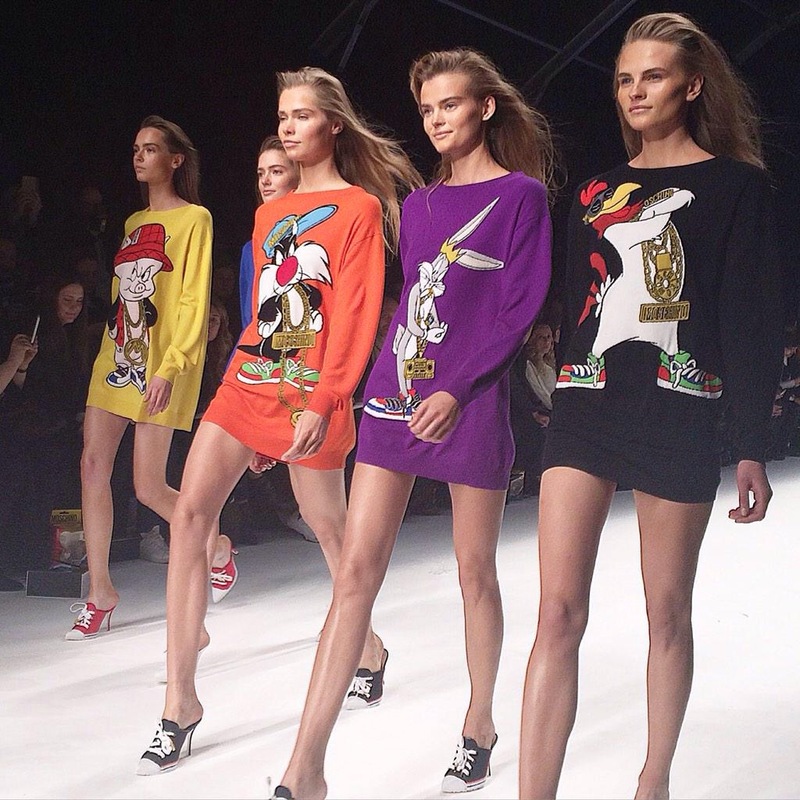 One thing’s for sure, if you buy into this collection, you’ll be in with the cool kids and you can absolutely, definitely sit with us.